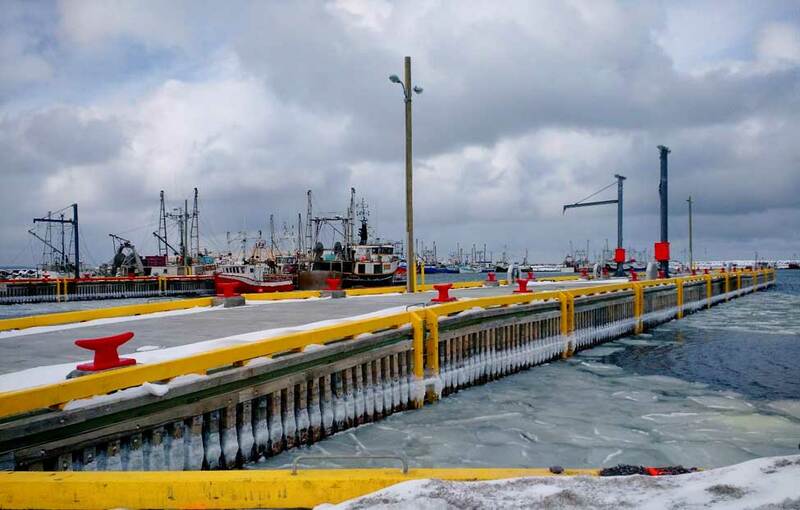 The Department of Fisheries (DFO), small craft harbours facility in Old Perlican is a major resource to the active fishing industry on the northeast Avalon Peninsula. As a result of deteriorating wharf structures and supporting infrastructure, there became a need to consider replacing these structures in order to sustain the fishing industry for many more years to come. In evaluating replacement options there became a need to expand on what previously existed. The growing industry in Old Perlican needed to accommodate larger vessels and provide additional berthing spaces for the local fleet. Meridian was engaged by DFO in the Fall of 2014 to start the design of the new crib and span wharf structures which was to consist of two (2) separate finger pier wharves measuring 121 m and 84 m, respectively. Both finger piers extend outward from an existing marginal wharf. The design was completed in March 2015 and construction commenced in September 2015. During construction, Meridian provided fulltime inspection and overseen all contract administration duties along with the Departmental Representative. The project was successfully completed in November 2016. As a result of this project, we would consider the harbour facilities in Old Perlican to be among the best in the province and will continue to service the communities of the northeast Avalon for many years to come. Define and detail the complete removal of the existing timber crib wharf and span sections to facilitate the new structures. This also included removal of the concrete deck and other auxiliary components from the existing marginal wharf. Define and detail demolition and removal of underwater concrete scour pads along perimeter of the existing finger pier structures. Design of two (2) new treated timber crib and span finger pier wharves with reinforced concrete deck. New wharf structures were designed with a deck elevation of +2.75 m and seated on hard bottom material at -5.0m. Approximate overall length of the new finger pier wharf structures were 121 m and 84 m. This design work also included reconstructing one new span section, increasing the existing deck elevation on an adjoining structure, new partial deck replacement on the marginal structure and new backfilled laydown area with scour protection. Define and detail the dredging limits of loose bottom material to the necessary depths for vessel clearance. Design of new electrical site upgrades including new electrical shed, new service, power pedestals, utility poles, site lighting, jib crane connections and conduits with cable installation in new concrete deck and above and below grade. All electrical design work was completed by others. Meridian assisted the electrical designers in providing structural and civil support. To minimize disruption to the fish processing plant and vessel traffic, the demolition and new construction work was split up into two (2) separate phases. This allowed vessels to access the plant for offloading and maintained some berthage space for the local fleet. The phased approach worked out very well and certainly added to the success of this project.